U.N. report on civilian deaths in Gaza: United Nations says Israel knew schools held civilians. 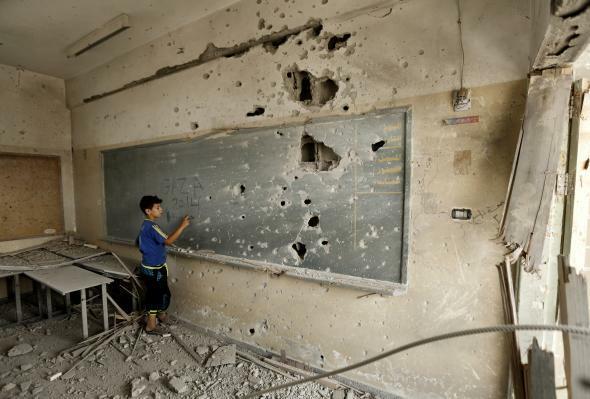 A Palestinian boy writes on a shrapnel-riddled blackboard at the heavily damaged Sobhi Abu Karsh school in Gaza City’s al-Shejaea neighborhood on Aug. 5, 2014. The internal inquiry is the first United Nations report to come out of the 50-day Gaza conflict last summer between Israeli forces and Palestinian militants affiliated with Hamas and other groups, which devastated the Mediterranean territory of 1.8 million people. The conflict left more that 2,200 Palestinians dead, and 72 were killed on the Israeli side, including 66 soldiers. It sharply raised tensions between Israel and the United Nations, which is responsible for administering an array of services to Palestinians in Gaza. United Nations officials said they had repeated communicated the locations of facilities harboring civilians to the Israeli military. Israeli military officials told the board of inquiry that U.N. facilities were not targeted and that Israel had instead been seeking to destroy stocks of weapons for Hamas, the Times reports. Israel has claimed that U.N. schools have been used as armories in the past, and the U.N. conceded in its review that a few of its other vacant schools were “probably” used by Hamas to launch rockets at Israel. The seven schools where the civilians were attacked, the U.N. said, contained no weapons and had been identified as “places of safety” for noncombatants. While the report sharply criticized the Israeli military, it stopped short of leveling accusations that Israel violated international law, the Times notes, though the report might be used to help support charges against Israel in the future. The Palestinian bid to join the International Criminal Court, which prompted months of economic retaliation from Benjamin Netanyahu’s government, was finalized at the beginning of April, raising the possibility of war crimes complaints against Israel for civilian deaths.